This tie-dye patterned swimsuit is perfect for the hippy-chick in you. It has two pieces so you can show off your toned abs. 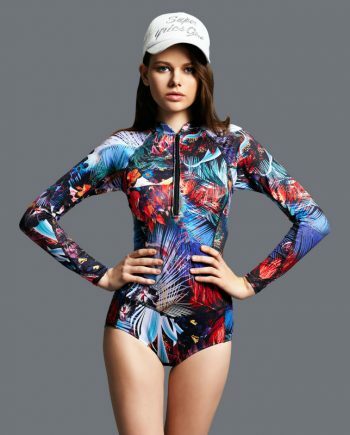 Plus, it has a long sleeve rash guard, so it’s ideal for when you go surfing. The highlight of the suit, is the playful fringe tassels that hang down the sides of the bottom. They give the suit a whimsical and fun feel to it.